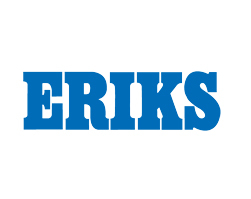 The ERIKS group is comprised of 50 companies offering logistics, engineering and manufacturing with branches in 13 countries across the globe. BDM has had a strong relationship with ERIKS for many years, and has provided training to over 70 of their managers in this time, mostly at level 3 and 5 in Management. Over the years, BDM has helped ERIKS to improve the overall quality of their management team and move the business forward through structured training. Laura Brookes, an ILM Level 3 First Line Management student, has found particular personal success from her qualification “At the time of learning, I was the Section Leader of a department. Since this time, I have been promoted to Office Manager. I think this was due to the qualification and the confidence that it has given me. 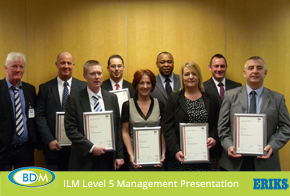 BDM continue to have a successful relationship with Eriks and in April 2013 a presentation saw 8 managers from Eriks received their certificates for successful completion of the ILM Level 5 Management Diploma. The course took a total of 12 months to complete and included both NVQ and VRQ qualifications. BDM Director, Ian White, revealed that due to the high standard of work completed with much of it being implemented directly into the business many of the students have been put forward further ILM recognition. The group agreed that although the qualifications were challenging they were ultimately rewarding and have has an inestimable impact on the business, with many of the group indicating their keenness in moving on to the degree. BDM would like to congratulate all of the group for all of their hard work in achieving the qualification. Let us get in touch?